I came across an article awhile back about doing salads in a jar and have finally gotten around to it! 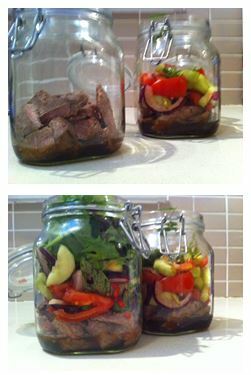 I chose to do a Thai Beef Salad in a Jar and it worked great. It’s super simple and a perfect way to take a healthy lunch to work. Assuming all your ingredients are super fresh when you make your salad, it should last for up to 5 days in the fridge. It’s really important to have your dressing as far away from the salad leaves, so that they stay fresh and don’t go soggy. When you’re ready to eat your salad you can either use a fork and eat straight from the jar, or empty the contents in to a bowl. Would love to hear more ideas for salads in a jar – please leave a comment below.